Chronic, America Honey, Moonlight, Jackie and Manchester by the Sea are this year’s five films nominated for Best Feature at the Film Independent Spirit Awards. Each film uniquely encompasses loss and shows how characters move forward from the trials and tribulations of life. Chronic gives an unsettling insight into the lives of care workers and their patients. As Stephen Holden wrote about the film in The New York Times, “Radically unsentimental, it portrays the end of life largely without the emotional concomitants of grief, suffering and solace. Its icy aura of inevitability befits a film whose central character goes from client to client like a polite, expressionless deputy of the Grim Reaper.” Tim Roth’s portrayal of David, a caregiver on the point of breaking, is both divine and unnerving. The film is also nominated for Best Male Lead for Tim Roth. Middle America is where the ideology of the American Dream still wafts around the noses of the young and restless, luring them into a life of adventure, heartbreak and greed. However, there is always one shining “Star,” who dares to be different. “Like the inspiration for its title, there’s a wild sweetness to the people, and maybe even to the land, depicted with such breathtaking honesty and raw beauty in American Honey,” said Mike O’Sullivan for The Washington Post. “Sometimes life is not built like a house with three acts like three stories. It is more like a river which flows onward,” writes Joe Morgenstern for The Wall Street Journal. To be young, sweet and in love, American Honey shows us the perfect mixture in a coming-of-age tale. The film is also nominated for Best Director, Best Supporting Male, Supporting Female and Cinematography. This film breaks the filmmaking norm, taking its audience on an unpleasant yet surreal and awe-inspiring journey. It leaves you breathless and wanting more. A.O. 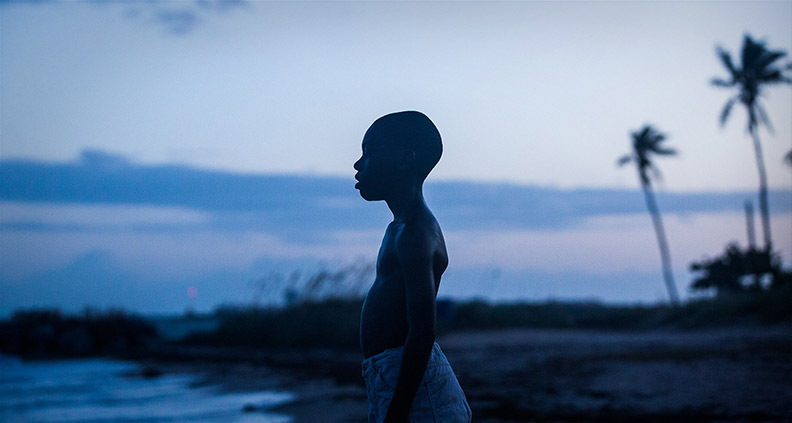 Scott wrote in the New York Times, “In structure and tone, Moonlight sets itself against the earnest, austere naturalism that has become a default setting for movies about social misery.” As we travel with Blue, Chiron and Black we see this curious young boy transition into a man on his journey through self-discovery. Through each segment of the film we see him lose himself and his identity only to reclaim both during his most authentic and lowest moments. This character, although thwarted by his surroundings, uses his curiosity and need for love to lure the audience and allow them to truly examine the plight of a young, gay black male. Scott later wrote, “Though it is agonizing to witness [Chiron’s] progress, it is also thrilling. To be afforded a window into another consciousness is a gift that only art can give. To know Chiron is a privilege.” The film is also nominated for Best Director, Screenplay, Cinematography, Editing and has already won the Robert Altman Award for ensemble cast. There’s a slow nature to this film directed by Pablo Larraín, but don’t let that fool you. Natalie Portman’s portrayal of the grieving Jacqueline “Jackie” Kennedy is everything we never knew we wanted to see. 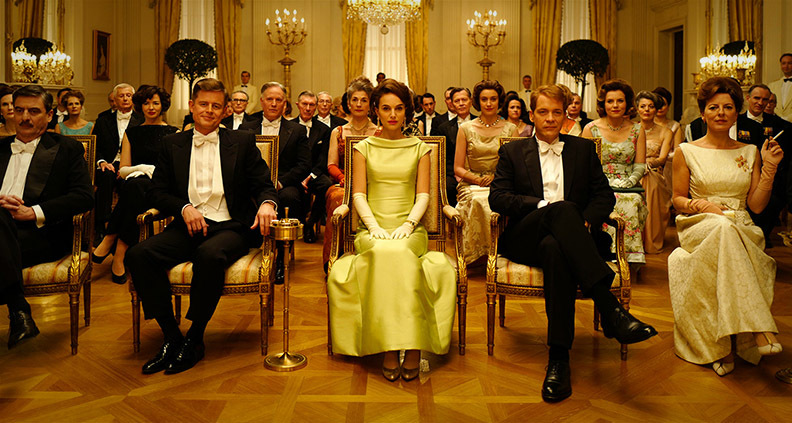 The film focuses on her life in the week after the death of her husband and former President John F. Kennedy. Jackie struggles and strives to make sure that her husband’s legacy and family are not forgotten within the walls of the White House. It’s unnerving at times to see such a raw and provocative portrayal of a grieving woman, but it’s merely a reminder of what it means to lose the love of your life. In a review by Guy Lodge for Variety, he says, “The complicated, colliding feelings of anger, confusion and cold acceptance that come with any personal loss are mapped out here with a sense of fine-tuned chaos.” Jackie makes you want to reach out towards the screen and grab Portman’s hand, if only just to soothe her aching heart. The film is also nominated for Best Director for Pablo Larraín. At its core, this film is about strength laced in sarcasm. It’s about the ability to continuously get up and move forward, realizing those small movements are a feat. It shows us humanity in the aftermath of a tragedy and that laughter can also be a good medicine. Casey Affleck’s portrayal of Lee Chandler, a grief ridden prodigal son, is an intriguing observation of a man livening a content-hollow life. Lee carefully balances life and death in order to maintain his routine and familial obligations. 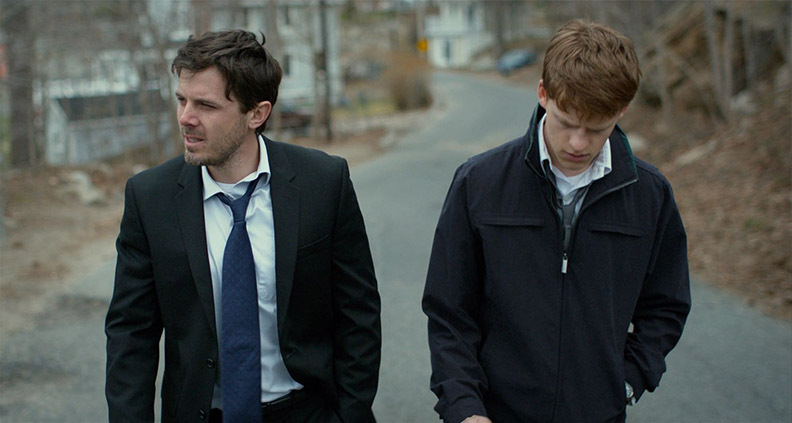 “Manchester by the Sea is a more focused work, one about Lee’s efforts to overcome his past, and his sadness at the comparative ease with which those around him have done so. In the brooding Affleck, [writer/director] Kenneth Lonergan has found a perfect leading man, and together they’ve made a drama of rare power—a tale of human suffering that succeeds because of its love for its characters, rather than for their misfortunes,” writes David Sims The Atlantic. The film is also nominated for Best Screenplay, Male Lead, Supporting Male and Editing. For more information about the Spirit Awards, click here and subscribe to our YouTube channel to watch speeches and highlights (also: Twitter, Facebook and Instagram). Not a Member of Film Independent yet? Become one today.